Jerome Rogowski, owner of Aum & Garden, wants his diehard garden-aficionado clients to rest assured. The Sherman Oaks store’s name change (previously just Garden—the exterior signage will change in a few weeks), does not mean the shop will stop carrying the wares that have made it such a San Fernando Valley favorite. That said, both the economy as well as client tastes have led to an expanded product line—one that only enhances the store’s one-of-a-kind boutique shopping experience. “We started noticing clients were drawn to spiritual statues,” Rogowski said, noting that while the shop does not focus on religion or spirituality, it does have Christian, Buddhist and Judaic objects as well as a book selection that is both spiritual and thought-provoking in nature. For gardeners, the common ground between gardening and spirituality should not be surprising. Aware that many shoppers are buying gifts for others, Rogowski offers goods at a range of prices. 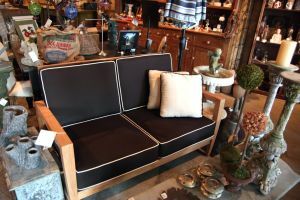 Often told that the store is reminiscent of a Chelsea, N.Y., boutique, Rogowski is confident that he can track down whatever a customer desires through his approximate 450 vendor contacts across the country. Not that customers don’t already have quite a selection. 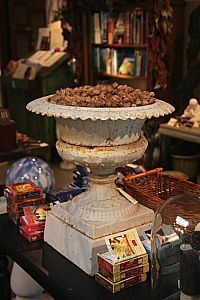 Among the eclectic shop’s goods are pottery, statuary, gardening books, candles, incense, jewelry, vintage items, paintings, photography, and birdhouses. A recent favorite for many customers has been pewter fairies handmade in Tennessee, which Rogowski believes are popular due to the mythological creatures’ connotations of playfulness and imagination. Also a best-seller has been vintage rosaries, which Rogowski notes that many purchase for their beauty, not just their religious significance. On the more traditional side, an antique Victorian urn, priced at several hundred dollars, sits a few feet away from a smaller, made-in-China replica that runs less than $100. 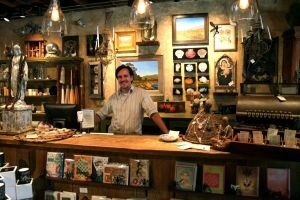 And that still doesn’t begin to cover it, if not only for the fact that the store also shares a space with Mulberry Row, a floral shop and garden-design business. There is no end to the diversity of products at Aum & Garden. 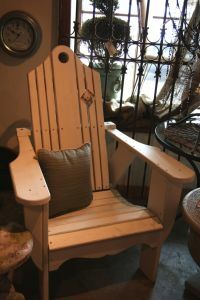 From furniture, to greenery to gifts, there is much to choose. And if you can't find it, owner Jerome Rogowski can surely find it for you. Co-owned by Alicia Payne and Robin Weiner, the full-service flower shop features goods such as luxurious soaps and lotions, making it the perfect one-stop shop for gift-givers. And for yoga practitioners and other events-minded individuals, an onsite gallery/meditation room allows the store to offer yoga classes, show films and present speakers. Amanda Traxler is an L.A.-born writer with degrees in journalism from the University of Kansas and creative writing from the School of the Art Institute of Chicago. She has been rediscovering her roots since she returned to the area three years ago from the wintry Midwest.